Half-day extension for groups of 4 to 17 people. It offers the opportunity of visiting the Montsonís Castle which is the headquarter of the Cultural Castles Foundation of Catalonia and the dwelling of the Albi Barons. 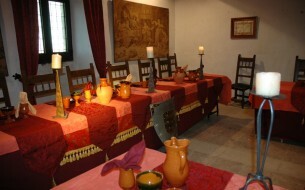 Includes meals with local products and different wine tastings from D.O Costers del Segre and also local products from the area. - Throughout the day, will have a native russian speaking guide. - Entries are included in all the tours packages. - Pick-up costumers at the same hotel and arrivals before lunch or dinner. - Taxes, transfers, guides, entrance fees and meals are all included. - Children between 7 and 12 years have a reduced price. - Children under 6 have free admission. 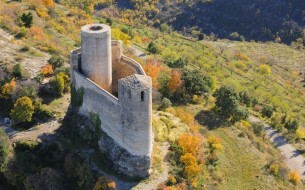 In the village of Montclar, located in the county of Urgell, in the highest part of it stands imposing medieval castle. It is the oldest castle in the area, Historical and Artistic Monument national. A trip to the time of the conquest! 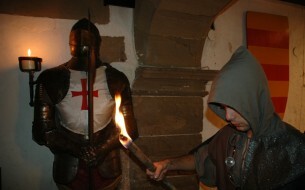 Dressed as different characters in the twelfth century explain the various facets of life in the castle, combining the visit with the use of torches through a wire around the time of the conquest, the struggles between Arabs and Christians. Mur castle is an imposing fortified wall strategically located in the top overlooking the Tremp basin and reservoir Terradets where you can enjoy the wonderful views of the landscape and the beauty that surrounds it.